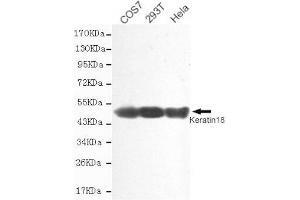 Western blot detection of krt18 antibody in Hela, COS7 and 293T cell lysates using krt18 antibody (1:2000 diluted) . Purification The antibody was affinity-purified from mouse ascites by affinity-chromatography using epitope-specific immunogen. Immunogen Recombinant full length Human Cytokeratin 18. Background Cytokeratin 18 encodes the type I intermediate filament chain keratin 18. Keratin 18, together with its filament partner keratin 8, are perhaps the most commonly found members of the intermediate filament gene family. They are expressed in single layer epithelial tissues of the body. Mutations in this gene have been linked to cryptogenic cirrhosis. Two transcript variants encoding the same protein have been found for this gene.Involved in the uptake of thrombin-antithrombin complexes by hepatic cells By similarity. When phosphorylated, plays a role in filament reorganization. Involved in the delivery of mutated CFTR to the plasma membrane. Together with KRT8, is involved in interleukin-6 (IL-6)-mediated barrier protection.